^ a b c d e f g h i j k l "10th Special Forces Group 1st Special Forces Regiment" (URL). Archived from the original on 2017-02-09. Retrieved 2017-02-11. ^ a b "Special Forces: The Early Years" (URL). Retrieved 2017-02-11. ^ States New Service (30 June 2010). 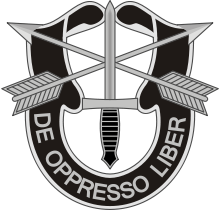 "The Ideal Green Beret". HighBeam Research. Archived from the original on 11 June 2014. Retrieved January 16, 2014.